President Vladimir Putin plays a game of Night Hockey in Moscow's Red Square; a way of letting off some steam perhaps, before being formally backed by Russia's ruling party for next years presidential election. Putin is running as an independent candidate, keeping a distance from the top Kremlin party, United Russia, which consists mostly of officials and has been dogged by corruption allegations against some of its top members. Despite that, Putin showed up to speak at United Russia's congress. Party head and Prime Minister Dmitry Medvedev said the party was Putin's party, and his key political resource. 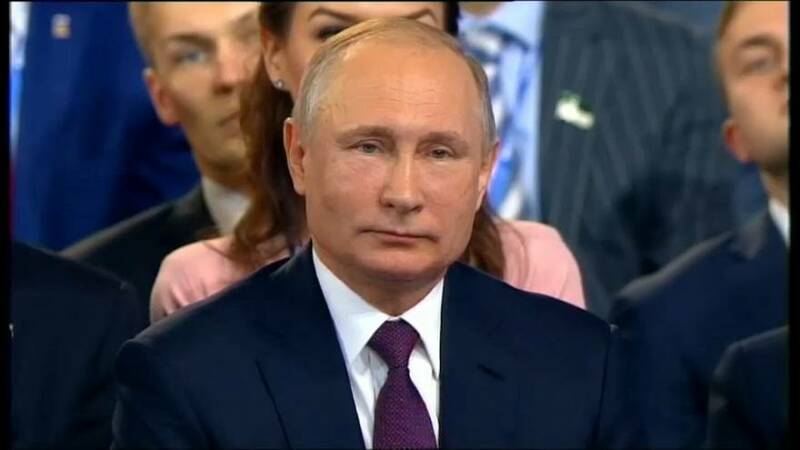 "We need to achieve a long-range steady increase in real incomes of citizens, to increase pensions and social support,"
With his approval ratings topping 80 percent, 65-year-old Putin is set to easily win secure his fourth, six-year term in the March 18 vote. He'll be facing Russian Communist Party candidate, Pavel Groudinine, who was unexpectedly appointed, instead of their chief Gennady Zyuganov, a fixture of past campaigns, in a bid by the party to widen its political appeal. 57-year-old Grudinin is the director of a successful strawberry farm near Moscow. Other veterans of past elections — liberal Grigory Yavlinsky and ultranationalist Vladimir Zhirinovsky — are also running. The involvement of Ksenia Sobchak, a sharp-tongued 36-year-old TV host, could raise public interest in the race. Sobchak, who was formally nominated by the liberal Civic Initiative party, presented her presidential programme on Saturday, defending a change in government in Russia from a presidential republic to parliamentary republic. Sobchak has criticized the Kremlin's policies and called for democratic changes, but she has steered clear of any personal criticism of Putin, who in the 1990s served as a deputy to Sobchak's late father, who was the mayor of St. Petersburg. Putin's main opponent for the Kremlin, opposition leader Alexei Navalny, is barred from the race by an embezzlement conviction which he calls politically motivated. Navalny has threatened to organize a campaign for boycotting the vote, which would be an embarrassment to the Kremlin, which is worried about voter apathy and focused on boosting turnout to make Putin's victory more impressive. But on Sunday, he must be nominated as a candidate for his party at a meeting of his supporters.